While I am trying not to be buried under an avalanche of essays/papers this weekend, I cannot help but reminisce about my last trip to Hawai’i (no essays followed me there). On the trip, I was fascinated by the many signs that I imagine I am likely to see only in Hawai’i. 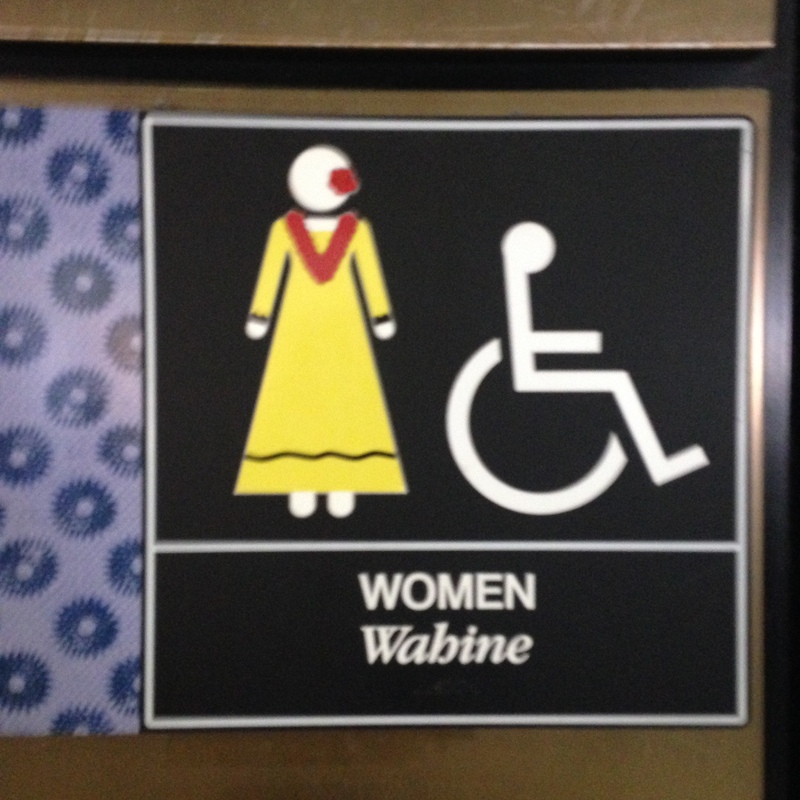 The signs for the restrooms at the Honolulu airport always make me smile, and I believe the Munich airport in Bavaria should adopt similar signs: lederhosen and dirndl. 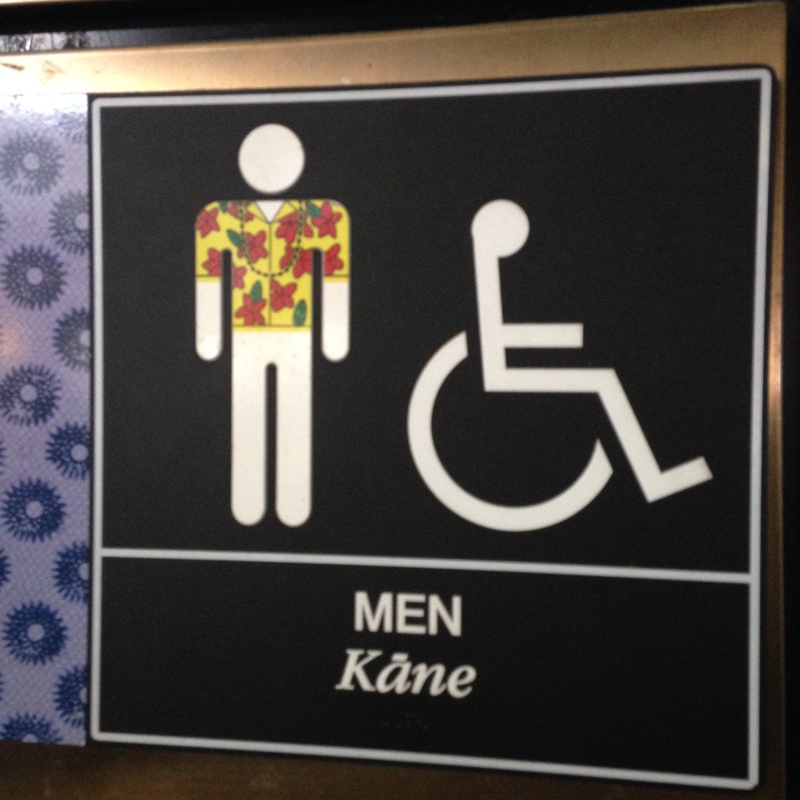 Even the figure on the bathroom sign wears a Hawaiian shirt and lei. But just as on the other sign , the person in the wheelchair is assumed not to be into Hawaiian fashion. People stared at me for taking pictures of the signs for the bathroom but they show that the Hawaiian decor touches everything. I wonder why the woman in the wheelchair did not get a lei though. 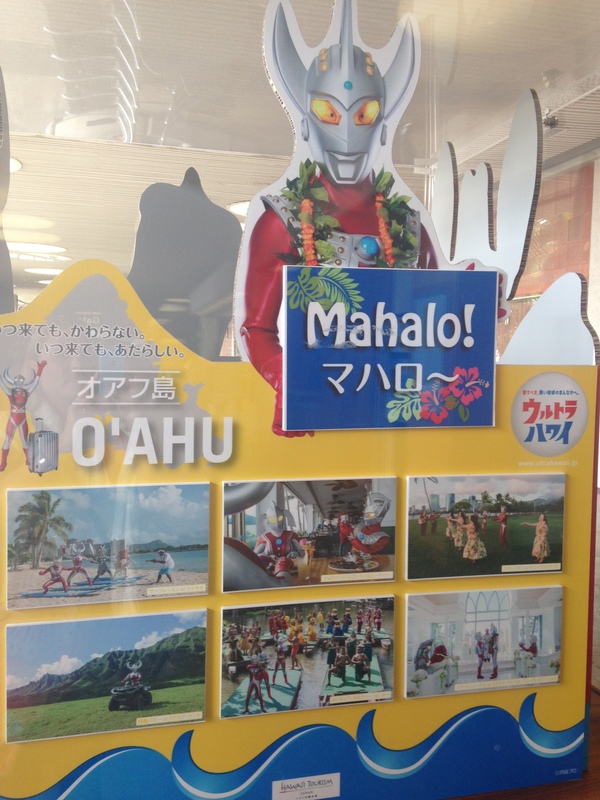 I found the marketing display geared towards Japanese tourists in the international terminal of the Honolulu airport rather entertaining; I have no clue who this character is and why he/she is participating in all these activities around the islands, but I am intrigued. I have never seen another country/place advertise itself with odd creatures. 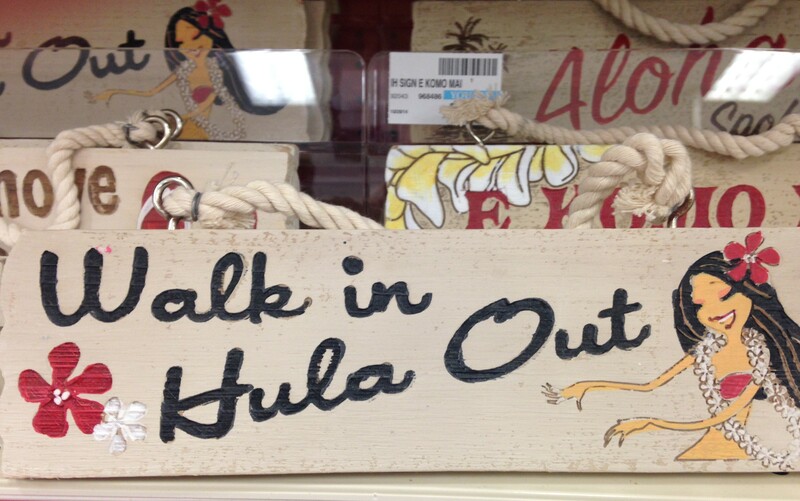 Plenty of signs with the expected references to aloha, hula, leis, and hula girls. 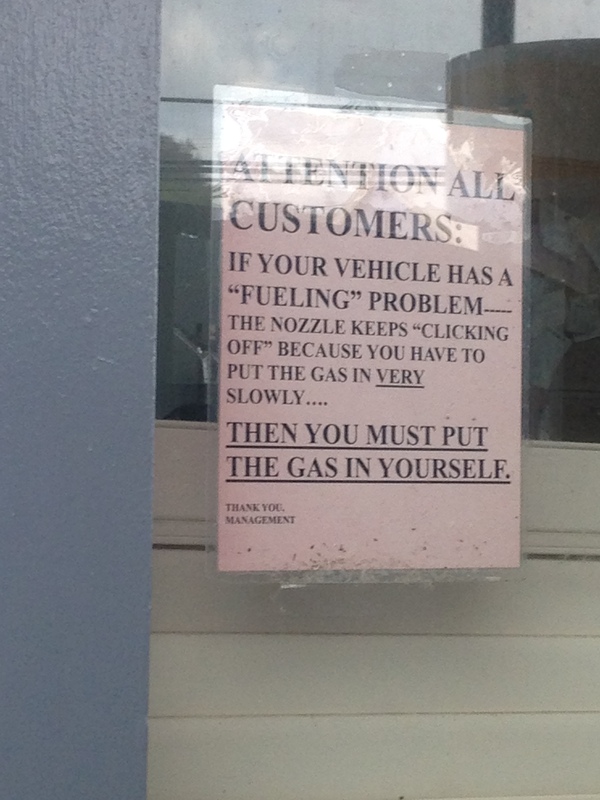 At some Kaua’i gas stations, gas is still pumped for customers. It felt odd to sit in the car and watch someone else pump the gas for me. Sign at a gas station in Lihue. Who knew there are still gas stations where self-service is not normal. My favorite brand of sunscreen available in Hawai’i (but originally from Florida) is Ocean Potion. In addition to its great sounding name (in my opinion), it also comes in the scent of sunshine. I have never really thought about what sunshine would smell like, but this truly fits: a little citrusy, a little sweet, and a little salty. I usually bring plenty of unopened bottles of Ocean Potion home to California to last me the year. The scent of the sunscreen is advertised as the scent of sunshine. Surfing is a major part of life in Hawaii. 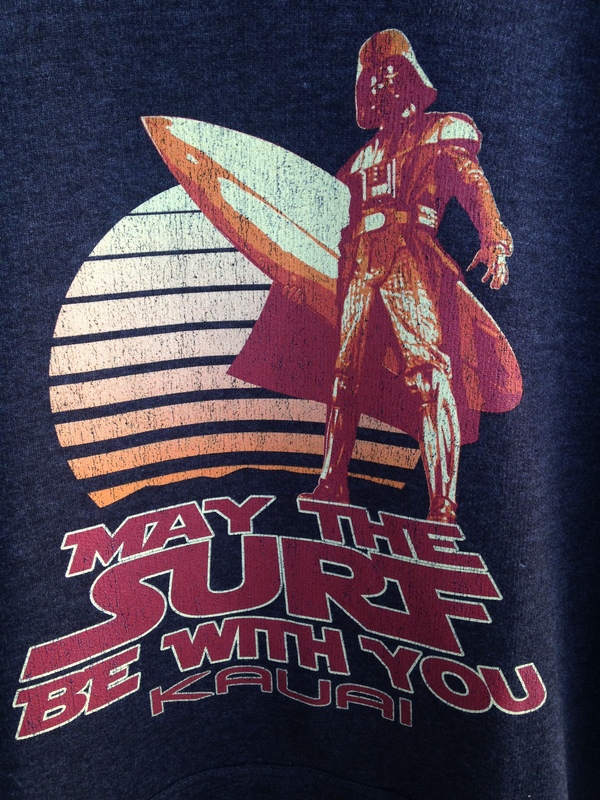 Maybe it is time to slather on the scent of sunshine and wear my surfing shirt before I get back to those essays that are still waiting for me. One of the pleasures of visiting Hawai’i for me is tasting the foods that are difficult to impossible to get here on the mainland, and I do not mean just the typical Hawaiian dishes such as kalua pork or poi. 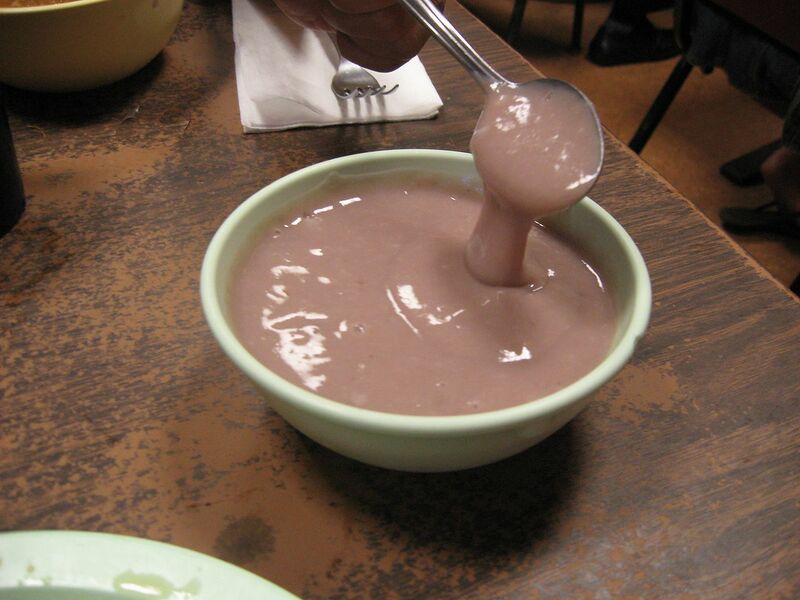 I am not the biggest fan of poi, the mush of boiled taro stems; I imagine if I would taste wallpaper glue (not that I ever have tasted it or have the desire to do so), it would taste like poi. 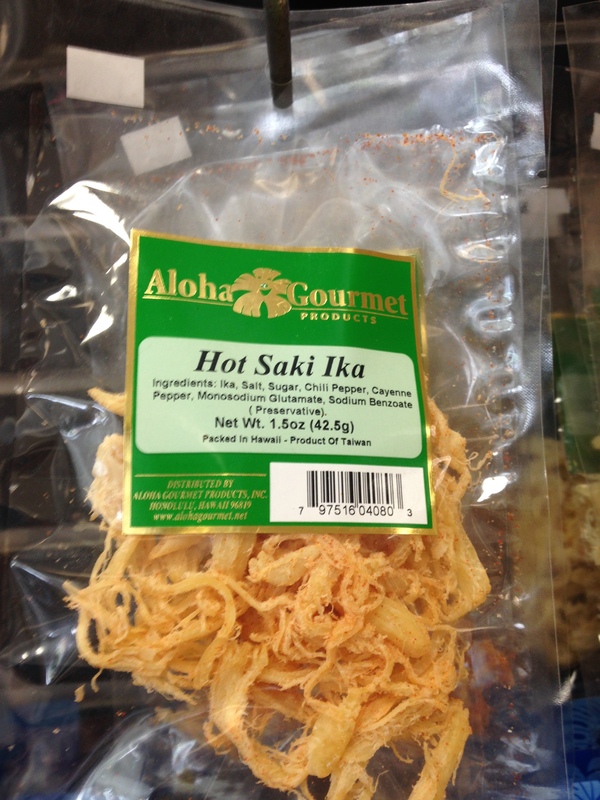 But to get the Hawaiian culinary experience, I usually eat poi at least once on my trip. 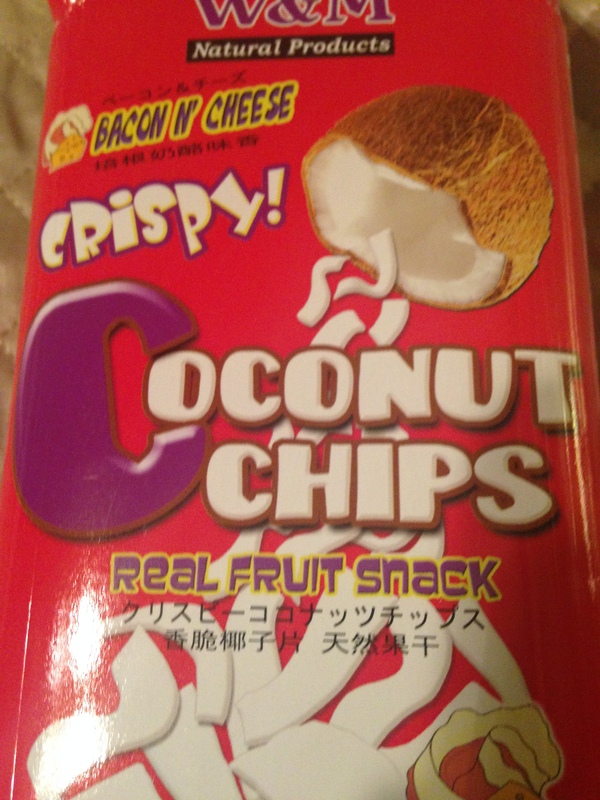 What I really look forward to are the snacks that are not usually listed under Hawaiian cuisine. 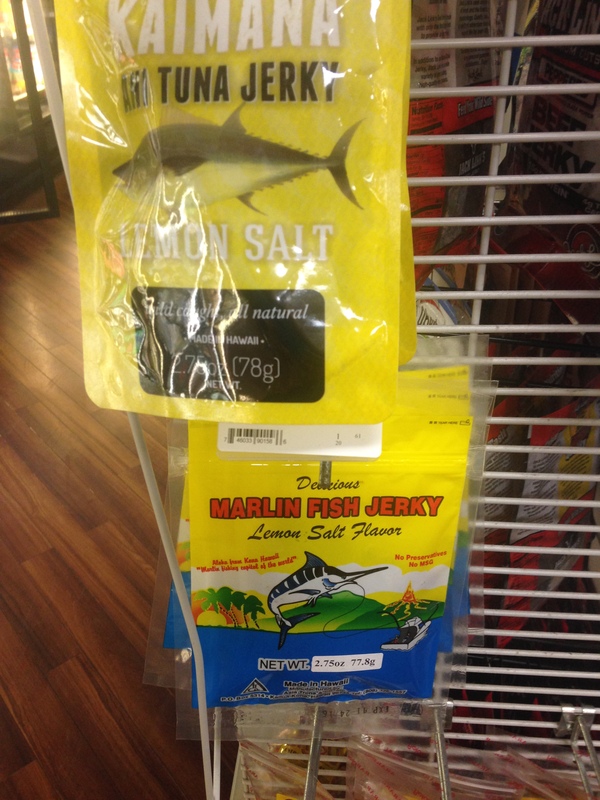 These include the wide variety of fish jerky. While on the mainland jerky seems to be limited to beef and turkey and possibly deer, fish jerky seems to rule supreme based on the many varieties offered in all supermarkets. Different versions of fish jerky. Some type of fish or octopus jerky – I am not sure; but it was tasty. 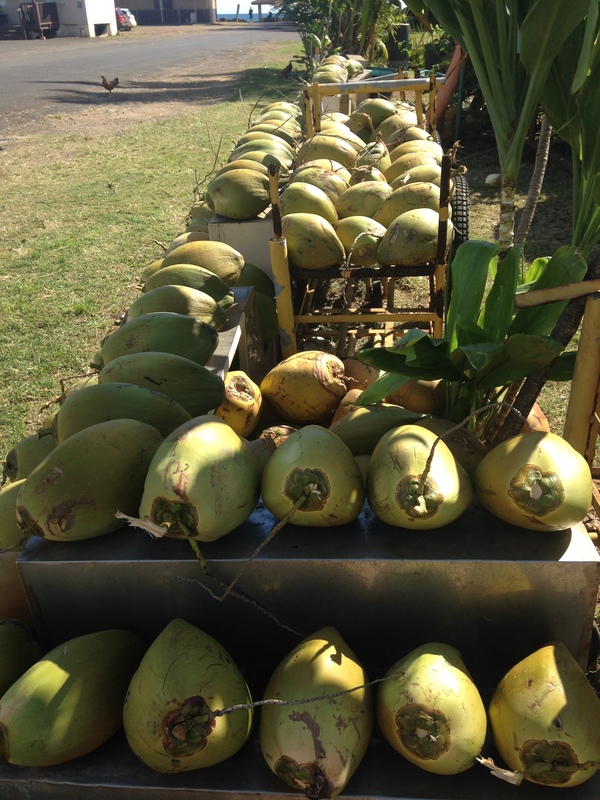 Coconut seems to be another favorite – whether fresh or dried. I guess the idea is that really everything is better with bacon. Of course, there are always Spam and macadamia nuts, so the next “logical” step is of course to combine the two for Spam-flavored macadamia nuts. 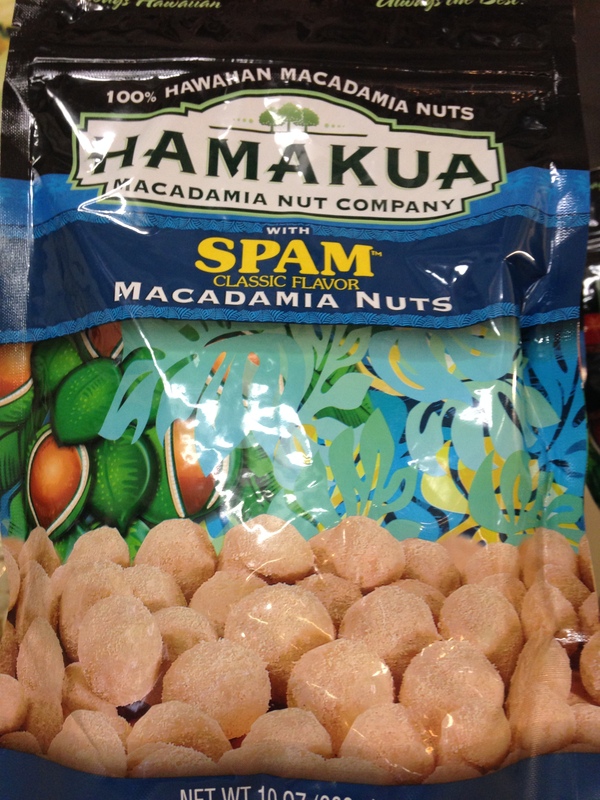 Spam is one of the favorite foods of Hawai’ians, so it is not a surprise that even macadamia nuts are flavored with spam. A common Hawai’i favorite for tourists and locals is shave ice (no, Hawai’ians do not call it shaved ice). I learned from Wikipedia that the main difference to a snow cone is that the ice is shaved and not crushed for shave ice. In contrast to a snow cone, shave ice is fluffy and seems to retain the flavor syrup better than a snow cone. 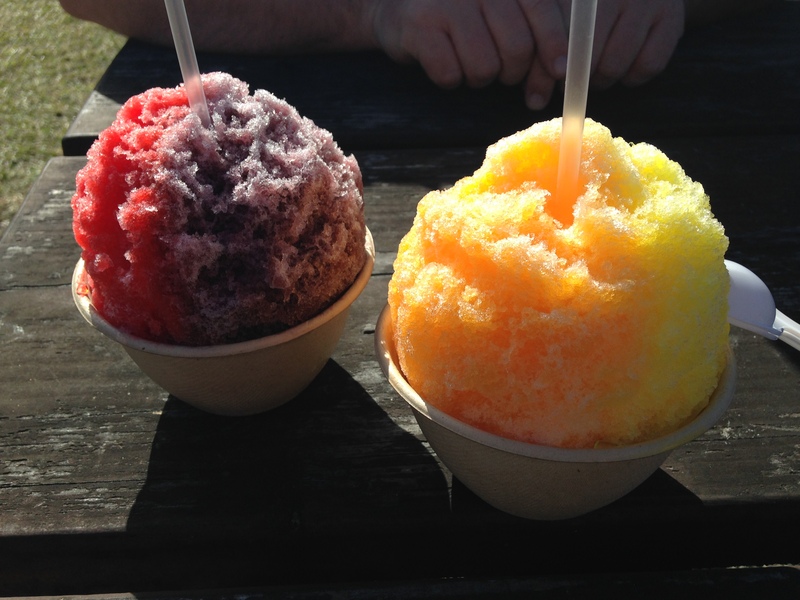 The shave ice creates a light snow-like substance that rivals the consistency of fresh powder that skiers seek. Hawaiian Shave Ice – it is never as fluffy and snow-like anywhere else but in Hawai’i. The rock walls terracing this area of the garden are about 700 years old. Another great advantage of living in California is that Hawai’i is just around the corner (relatively speaking). While plenty of my Austrian relatives and friends want to make the trip to Hawaii, the journey often seems too long and too expensive in comparison to trips to other exotic locales such as the Maldives from Europe. However, I ran into a lot more Germans at this year’s trip to Hawai’i than ever before and the local Hawaiian newspaper also reported about an Austrian who nearly drowned in Kaua’i. So clearly, more European tourists are showing up on Hawai’i. Even though this was not my first trip to Hawai’i, I am still fascinated by many of the small details and appreciate each trip I take. So while California has many good traits, the possibility for a quick winter trip to Hawaii is definitely another plus point in my book. At the beginning of the new year, I spent a fabulous nine days with sunshine and temperatures in the 80s while most of Northern California was shrouded in fog and nighttime temperatures close to freezing. I do not just appreciate Hawai’i’s warm climate but all its oddities; and on every trip I still find plenty of things that amaze me. I can never get tired of Hawai’i! 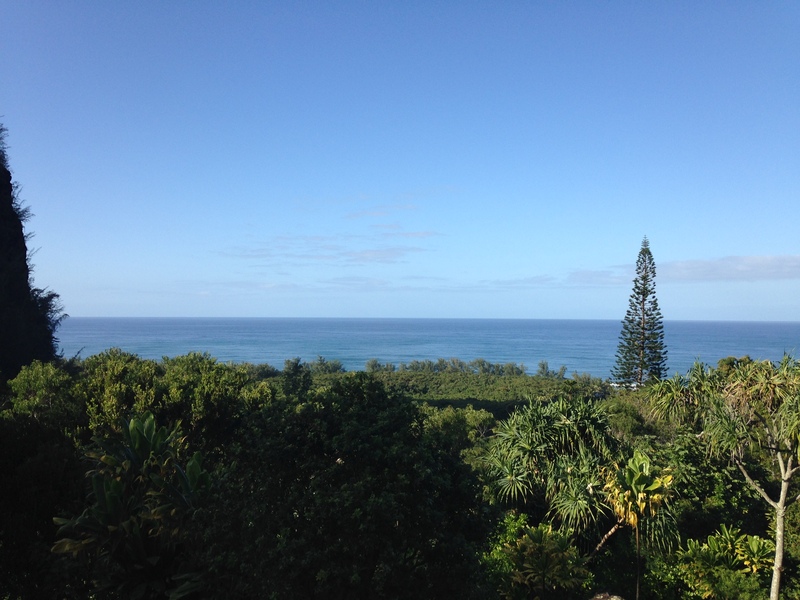 This year, we spent time on Kaua’i, the Garden Island. Just as the name implies, the island offers plenty of unusual plants and thus also several botanical gardens (Google shows eight botanical gardens on Kaua’i). 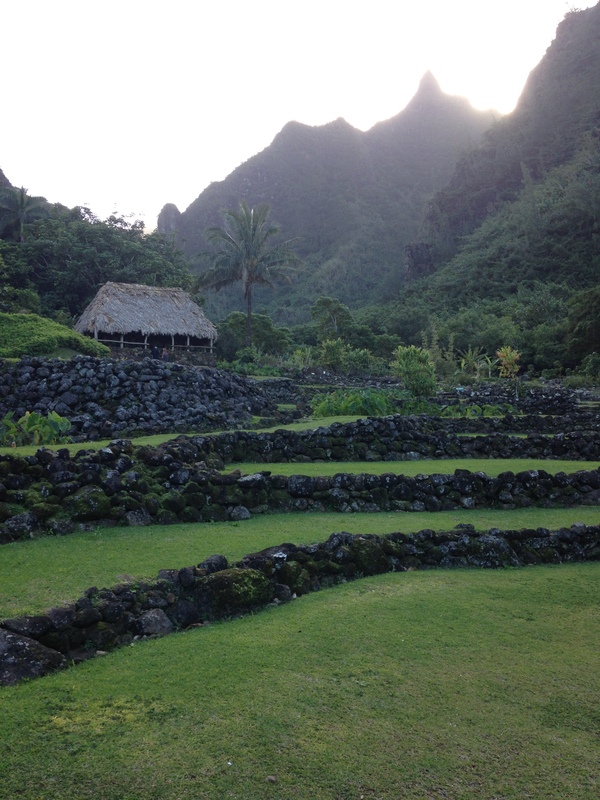 I had a chance to visit Limahuli Garden and Preserve, a National Tropical Botanical Garden in Ha’ena, Kaua’i. It is situated in a 1,000-acre valley with nearly 250 taxa of native plants and birds; about 50 of them are on the verge of extinction. So if you want to see Hawaiian plants, this is the place to visit. The garden is divided into different sections that showcase the suite of plants that cultures carried with them as the migrated to Hawai’i. 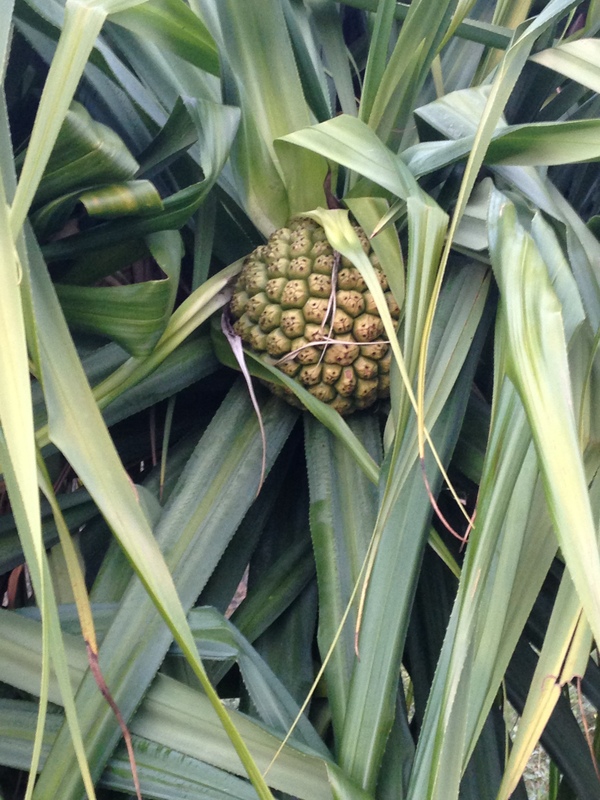 So many of the plants we think of as typically Hawaiian are actually not native to Hawai’i but were brought to Hawaii. For example, the Polynesians brought their 27 most important plants and four animals (jungle fowl, pigs, rats, and dogs) along on their canoes on their voyages to Hawai’i. Polynesian introductions to Hawai’i include taro, ti, sweet potato, banana, coconut palm, sugar cane, kukui nut tree and many more. 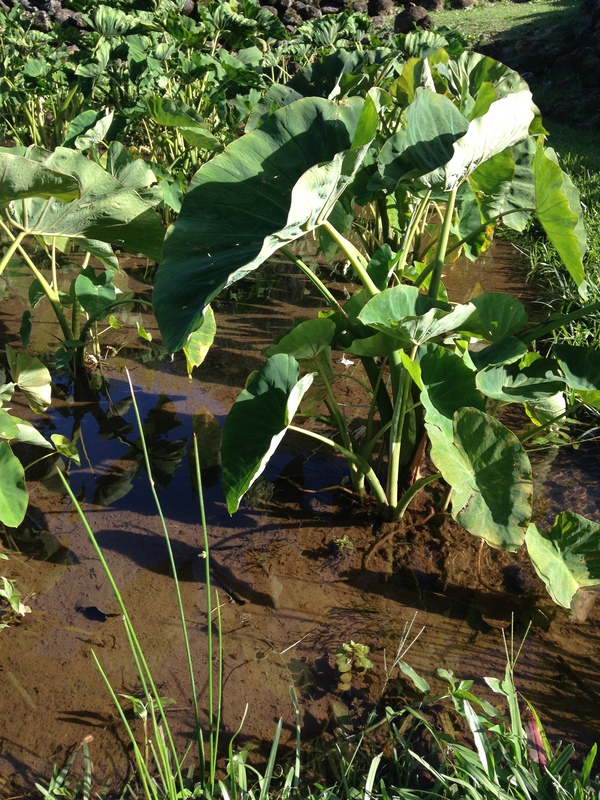 Taro is a Polynesian introduction to Hawai’i. Every part of the plant is edible when cooked. After Captain Hook first anchored off the Hawaiian Islands in 1778, many immigrants from China, Japan, Portugal, and the Philippines arrived in Hawai’i, especially because of the work on the sugar plantations. Many of the immigrants brought their favorite plants from home to Hawai’i, and many of these plants seem to be so representative of Hawai’i even though these plants are immigrants as well. Some of these plants are plumeria and mango. 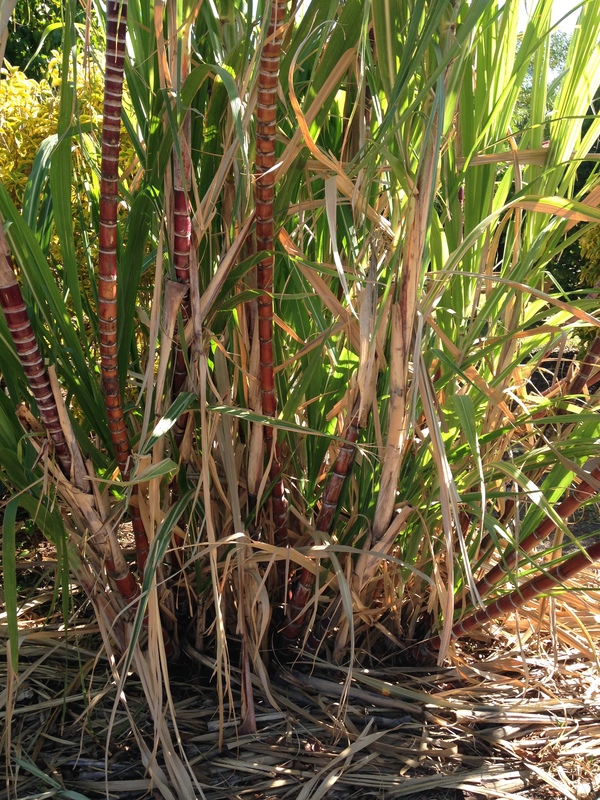 Sugar cane is another Polynesian introduction even before it became a commercial crop in the 1800s. The garden showed Hawaiian indigenous species, which means they are native to Hawai’i, endemic species, which evolved from native species and are native to Hawai’i only, as well as native species, which reached Hawai’i without the aid of humans but either by wind, wings, or water. Nearly all the native plants are rare and endangered as 114 of Hawai’i’s 1,200 native plant species are already extinct and about 300 have only 50 individuals or less remaining in the wild. The garden also offers a pleasant walk with stunning ocean views and much information. I have never really considered the impact of immigrants on the plant life of a country, and I was surprised to learn that so many plants that I associate with Hawai’i, such as plumeria and the coconut palm, are actually not that Hawaiian at all. Details and numbers are from the guidebook provided by Limahuli Garden, revised summer 2013. 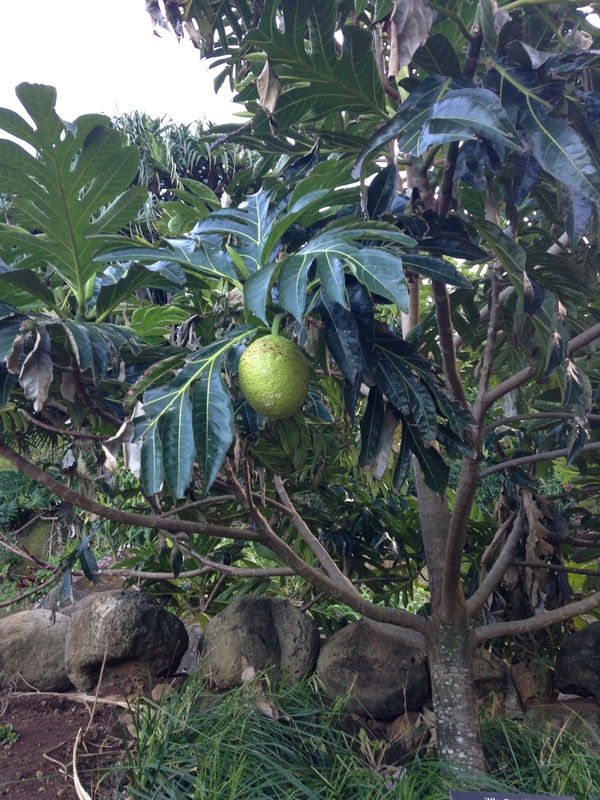 The breadfruit is another Polynesian introduction to Hawai’i as staple food in much of Polynesia. 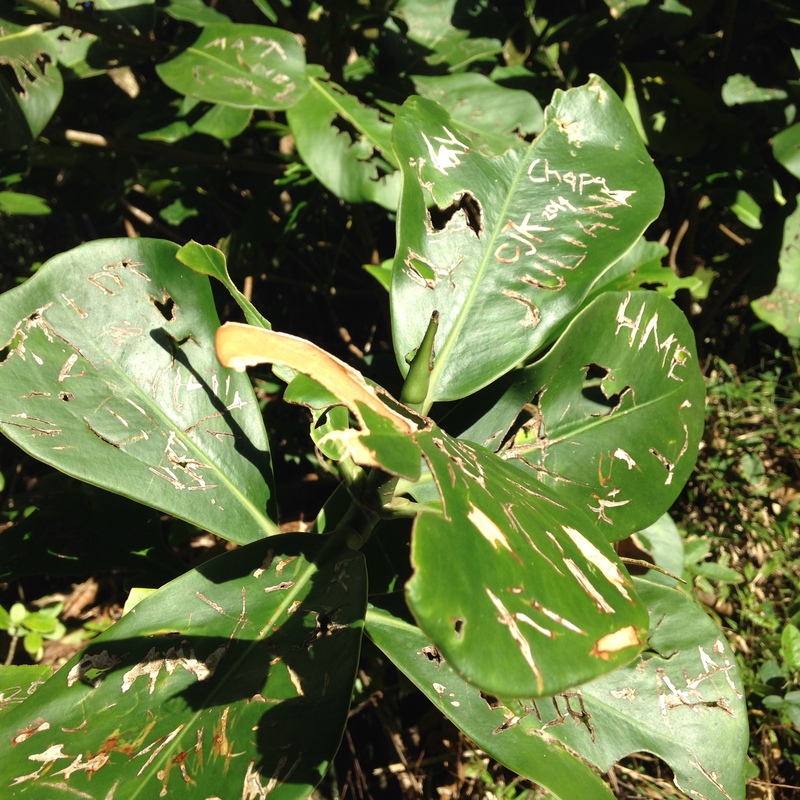 The autograph tree is a modern introduction to Hawai’i and has become an invasive weed. The leaves are easily marked with a scratch. 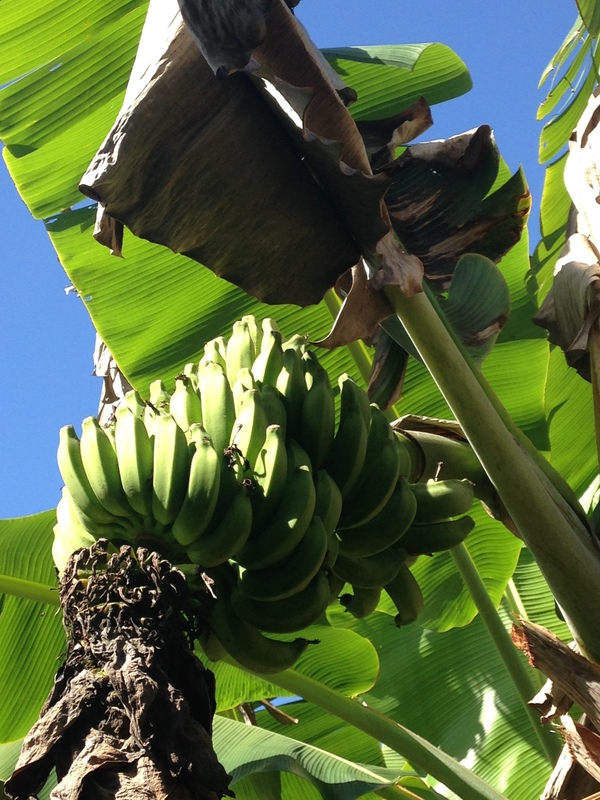 The banana is a Polynesian introduction, with as many as 70 Polynesian varieties developed in old Hawai’i.